Last week came the news that Hapag-Lloyd Cruises is going to expand on two fronts, placing an order with STX St Nazaire for a new ultra-luxury ship and chartering Oceania Cruises' Insignia from April 2012 for the premium market. Meanwhile, just as The Cruise Examiner reported on growth in the Australian market (December 27, 2010), Carnival Cruise Lines announced that it will base its Carnival Spirit Down Under year-round as of October 2012. This is a loss, however, to the California market, which yesterday saw the Mariner of the sail from leave Los Angeles on her last cruise before being transferred to Texas. Meanwhile, while the new Queen Elizabeth called at Port Everglades, Florida, yesterday we have a look at a voyage that took place in the original Queen Elizabeth sixty-five years ago. Hapag-Lloyd Cruises, the upmarket cruise division of TUI, has announced a strategic expansion of its product in 2012 and 2013 that will see the addition of two ships and 1,214 berths to its existing fleet of four ships with 1,176 berths. 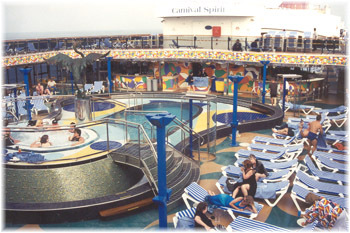 This essentially means a doubling of the cruise line's capacity by 2012. A new 516-berth 5-star ship, to be named Europa 2, has been ordered from STX St Nazaire for delivery in the spring of 2013, thus more than doubling its ultra-luxury capacity. But even before that the 698-berth Columbus 2 will join the fleet on bareboat charter from Oceania Cruises, who will be taking delivery of their new Riviera, sister ship to the Marina..
Sebastian Ahrens, Managing Director of Hapag-Lloyd Cruises: "We are pleased to be increasing our product diversity with both ships with the aim of reaching new target groups. The Europa 2 is the logical further development and contemporary interpretation of a luxury ship and, as sister ship to the existing Europa, will be positioned as a lifestyle-oriented and informal 5-star vessel. The Columbus 2 fulfills the demand for a relaxed, small premium ship with a modern concept in the German-speaking cruise market, and therefore offers an expansion of this segment, which is attractive for us by its nature and in commercial terms." The Europa 2 will offer the largest amount of space per passenger on any cruise ship, with a passenger space ratio of 74.8 gross tons per passenger and all-veranda suite accommodation with a minimum size of 28 square metres. Spa, penthouse and family suites complete the accommodation range. Seven restaurants, including a sushi bar, two lounges and four bars will offer culinary diversity and a multi-faceted entertainment program. A large spa and sport- and health-oriented facilities will do justice to the current trend for active holidays and wellbeing. With 7-day combinable cruises to the Mediterranean by summer and to distant destinations in winter, the Europa 2 will be particularly suited to fulfilling the requirements of guests taking time out from work and of families. Equipped with a fleet of Zodiacs, the Europa 2 will also be in a position to offer landings in small harbours and isolated bays off the familiar routes. The Columbus 2, on the other hand, will offer a very high standard of accommodation for the premium market. With four restaurants and three bars the ship has a diversity of dining facilities ranging from casual to informally elegant. W-LAN throughout the whole ship, along with Internet access points in the Library and Observation Lounge, enable passengers to remain connected, even on the high seas. The ship, which was built in 1998, in same shipyard in France where Europa 2 has been ordered, will sail in spring and autumn on 7-day combinable routes in the Mediterranean and in the summer months will offer 12-day cruises visiting Scandinavia and the Baltic Sea. 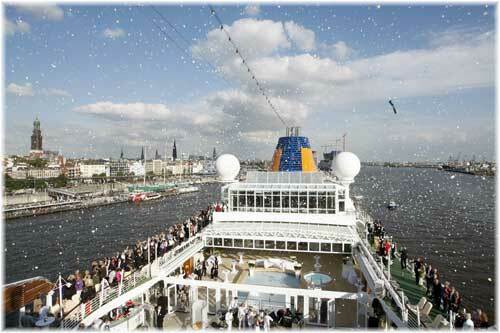 In addition, 2- to 3-day "introductory" cruises to coincide with Hamburg Cruise Days 2012 will give passengers the opportunity to get to know the ship. In the winter months the Columbus 2 will set off on a world cruise to distant destinations. TUI also operates TUI Cruises as a joint venture with Royal Caribbean Cruise Lines in the contemporary market, Thomson Cruises in the UK and Quark Expeditions in the US. Bookings on the Columbus 2 open next Tuesday, January 25. Last month, The Cruise Examiner took a look at growth in the Australian cruise market, noting that four ships operated by P&O Cruises Australia and two by Princess Cruises are now based there year-round. Now, they are about to be joined by a seventh ship from the Carnival family, with the announcement this Thursday from Carnival Cruise Lines that it will be basing its 88,000-ton 2,124-berth Carnival Spirit in Sydney year-round, from October 2012. This marks quite a departure for Carnival as although they have operated ships on a seasonal basis in the European market, it is the first time they will have based one of their ships full time outside the USA. Although North Americans and Europeans will be able to fly out to Sydney to join the Carnival Spirit, her prime target will be the growing local market, which is predicted to rise to one million cruisers by 2020. The ship will operate 8- to 12-day cruises from Sydney to the South Pacific islands as well as some 13-night itineraries that will include New Zealand. Carnival now operates 22 cruise ships and as the world's largest cruise line is expected to carry more than four million passengers this year. At the same time as Carnival announced that the Carnival Spirit would be going to Australia, it confirfmed that she would not be replaced in San Diego, a loss to the Port of San Diego of 60,000 passengers, with a cost to the local economy of about $54 million a year. Further north, however, the Carnival Paradise will still be based in Long Beach, offering 3- and 4-day cruises to Catalina and Ensenada and the Carnival Splendor will eventually return to service out of Los Angeles after her repairs have been completed. Meanwhile, Royal Caribbean International's 3,114-passenger Mariner of the Seas left Los Angeles on her final voyage yesterday, Sunday, and after a tour of South America she will be based at Galveston, Texas. As well as these two ships, the 2,348-passenger Norwegian Star will leave Los Angeles in May to bas based at Tampa. The Mariner and the Star have till now accounted for half of Los Angeles' cruise business. Despite the fact that it happens far from the ports of the Mexican Riviera, persistent drug-related violence has meant less interest in cruising to Mexico, which is the chief destination of California-based ships. 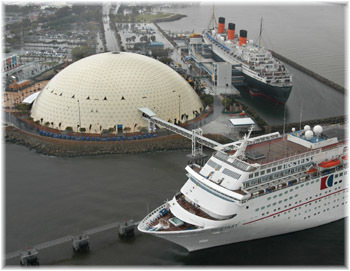 In the first six months of 2010 187 cruises docked in Mexican ports, compared to 290 in the same period in 2008. After Alaska's loss of business because of an ill thought out head tax that has since been partly reversed and Hawaii's loss of two out of it's three NCL America ships, this loss of business for California ports means the whole Pacific cruise market of the United States has now been adversely affected in one way or another. One small piece of good news is that Hapag-Lloyd's Europa is offering a 9-day cruise from Los Angeles to San Diego, Bahia Magdalena, Cabo San Lucas and Puerto Vallarta on her way to Acapulco on April 3, a return to US ports by Hapag-Lloyd. And in Mexico, Pullmantur has been operating cruises from Cozumel and a new start-up line called Corporacion De Cruceros Nacionales intends to begin cruising from Acapulco with the former Aquamarine, purchased last month from Louis Cruises and renamed Ocean Star Pacific. And in other good news, effective this month, with the delivery of the new Disney Dream to Disney Cruise Line, that company will now be operating the Disney Wonder from Los Angeles when she is not cruising from Vancouver to Alaska. The Queen Elizabeth's arrival at New York from Southampton last week reminds one that it was exactly 65 years ago thatr Winston Churchill made the same voyage in the original Queen Elizabeth, when he crossed from Southampton to New York in January 1946. Churchill was on his way to Miami Beach, where he would write his most famous speeches. After losing the 1945 election, Churchill's doctor had advised him to spend the winter months away from Britain. In the original Queen Elizabeth, still serving as a troopship, he thus arrived in New York on January 14, 1946, and proceeded by rail to Miami, arriving on the 16th. On the same day 65 years later, yesterday as it happens, the new Queen Elizabeth arrived in nearby Port Everglades. Churchill was a guest at the Miami Beach villa of Canadian industrialist Frank Clarke, who himself knew a little about ships and cruising, having been one of the founders of the Clarke Steamship Company. 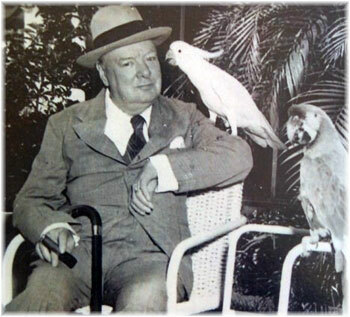 While in Miami Churchill attended the races at Hialeah, visited the Parrot Jungle in South Dade, painted his "The Surf Club, Miami" and received an honorary degree from the University of Miami. He also took the opportunity to fly to Havana, which he had last visited in November 1895, where he met Cuban President San Martin, acquired 10,000 Cuban cigars and dined with Ernest Hemingway. It was during this time that Churchill wrote one of his most famous speeches. Given at Fulton, Missouri, on 5th March1946, that speech came to be known as his "Iron Curtain" speech.